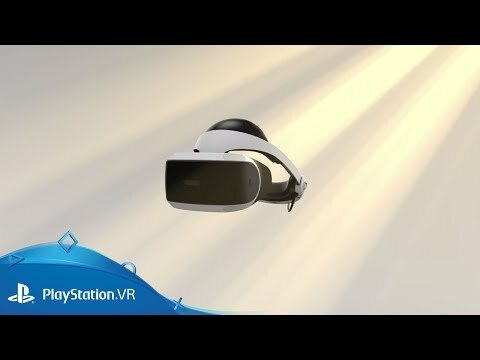 Learn how to get started with PlayStation VR. Sliding cover on Processor Unit. Serial number on rear of Processor Unit starting with P01/P02. Power button on in-line remote. Serial number on rear of Processor Unit starting with P03. Power button on underside of headset scope. Before you get started make sure that your PS4 and TV are switched off. Connect the processer unit to your TV with the HDMI supplied with your PS4 system. If your PS4 is connected to your TV unplug the HDMI from your PS4 and plug it into the processor unit. Connect the PS Camera to your PS4. The best height to place it is 1.4m (4’7”) from the floor. You can find out more about setting up PlayStation Camera here. Plug the HDMI (1) into the back of the PS4 and the processer unit. If you are using another HDMI, check its packaging to make sure it’s at least HDMI 1.4. Plug the USB cable (2) into the back of the processer unit and the front of your PS4. Connect the AC power cord into the adaptor cable (3) and plug into the electricity supply. Slide the processer unit connection cover back and plug in the VR connection cable (4). Connect the VR headset (5) to the VR connection cable (4). Switch on your TV and power up your PS4 via the DualShock 4 controller. Press the power button on the inline remote on the headset connection cable (5). You may be prompted to update PlayStation VR Device Software at this stage. We know you’re excited to get playing, but it’s really important to take your time with configuration to get the best possible gaming experience. Place the PS Camera about 1.4m (4’7”) high and about 2m (6’) away from where you will be sitting or standing. Your TV will show an image of what the PS Camera can see. Angle it to make sure it’s not picking up the surface it’s on. Position yourself where you will be playing VR, in the centre of the screen while you’re holding your DualShock 4 controller (DS4), PlayStation Aim, or PS Move controllers. This is important to make sure the PS Camera can place controllers in the right spot in the VR environment. If you and the controllers were not in the centre of the screen when you hit ‘Continue’ or if more than one person was in the Play Area, you may need to repeat step 3. If you’re still having problems adjusting the camera this could be because the room lighting is too bright. Find out how to set up your room for the best experience and try again. To reconfigure the PS Camera go to [Settings] > [Devices] > [PlayStation VR] > [Adjust PS Camera] on your PS4. Almost there! Next, make sure that the headset is as comfortable as possible. Follow the instructions here or go to [Settings] > [Devices] > [PlayStation VR]. Switch the headset on (I). If you are using earbuds put them on (making sure that left and right go in the correct ears!) and plug them into the stereo headphone jack (H). Be careful with the game volume to make sure it’s not too loud (K & L). Please note that Bluetooth earbuds and headphones are not compatible with PS VR - you must use wired earbuds or headphones. Remove the plastic lens protectors before putting the headset on for the first time. Hold the headset by the headband (A), not the scope (the bit with the blue lights), press the headband release button (E) and pull the front section forward. Place the headset on your head and release the headband release button. Tighten the headband using the adjustment dial (D) just enough to stop movement, but not so far that it feels too tight. Adjust the scope position by carefully holding it around the edges and wiggling it until it’s comfortable and the image is as clear as possible. If you are using over-ear headphones with a headband, put them on (making sure that left and right go on the correct ears!) and plug them into the stereo headphone jack (H). Be careful with the volume to make sure it’s not too loud (K & L). Please note that Bluetooth earbuds and headphones are not compatible with PS VR - you must use wired earbuds or headphones. To remove the headset, press the headband release button (E) and re-extend the head band (A). Lift the headset by the head band. You can also find these instructions on your PS4 by going to [Settings] > [Devices] > [PlayStation VR] > [Check How to Put On VR Headset]. Connect an existing HDMI cable between your TV and the HDMI (TV) port of your Processor Unit. Connect the PlayStation Camera to your PS4. The ideal height to place it is 1.4m (4’7”) from the floor. You can find out more about setting up PlayStation Camera here. Connect the HDMI cable (1) between your PS4 and the HDMI (PS4) port on the Processor Unit. Connect the USB cable (2) between the front of your PS4 and the rear of the Processor Unit. Connect the AC power cord into the AC adapter, and plug the adapter cable (3) into the rear of the Processor Unit. Now safely plug the power cord into an electricity supply. Connect the PlayStation VR headset cable (4) into the Processor Unit matching the symbols displayed. 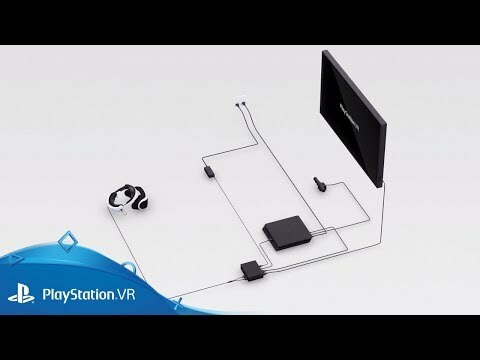 You can now connect your stereo headphones into the PlayStation VR headset. Switch on your TV and power up your PS4 by holding down the PS button on the DUALSHOCK 4 controller. Press the power button (A) located on the underside of the PlayStation VR headset scope. When the headset is turned on, the tracking lights on the rear will glow blue (B). You’re now ready to begin the headset configuration. Follow the on-screen instructions for the best results, but you can also follow the steps below. Switch the headset on using the power button (J) on the underside of the headset scope. If you are using the stereo in-ear headphones, plug them into the stereo headphone jack (H) and connect the headphone attachment to the headphone attachment hole (I). Hold the headset by the top of the headband (A), press the headband release button (E) and pull the front section forward. You can now put in your stereo headphones. If you are using over-ear headphones with a headband, put them on (making sure that left and right go on the correct ears) and plug them into the stereo headphone jack (H). You can adjust the volume using the buttons (N & P) on the underside of the headset scope. Please note that Bluetooth earbuds and headphones are not compatible with PS VR - you must use wired earbuds or headphones. Next, find out how to make sure you get the best possible experience when playing PS VR. Select the issue you’re experiencing for more help.